The original Mid-Course Correction, published 20 years ago, became a classic in the sustainability field. It put forth a new vision for what its author, Ray C. Anderson, called the “prototypical company of the 21st century”―a restorative company that does no harm to society or the environment. In it Anderson recounts his eureka moment as founder and leader of Interface, Inc., one of the world’s largest carpet and flooring companies, and one that was doing business in all the usual ways. Bit by bit, he began learning how much environmental destruction companies like his had caused, prompting him to make a radical change. Mid-Course Correction not only outlined what eco-centered leadership looks like, it also mapped out a specific set of goals for Anderson’s company to eliminate its environmental footprint. Those goals remain visionary even today, and this second edition delves into how Interface worked toward making them a reality, birthing one of the most innovative and successful corporate sustainability efforts in the world. The new edition also explores why we need to create not only prototypical companies, but also the prototypical economy of the twenty-first century. As our global economy shifts toward sustainability, challenges like building the circular economy and reversing global warming present tremendous opportunities for business and industry. 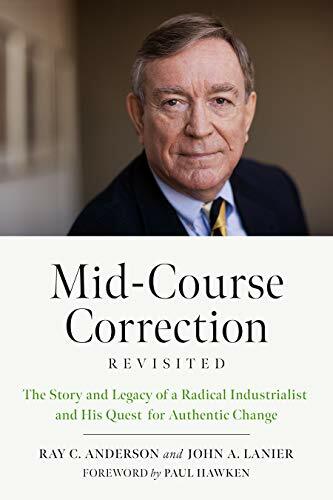 Mid-Course Correction Revisted contains a new foreword by Paul Hawken, several new chapters by Ray C. Anderson Foundation executive director John A. Lanier, and interviews with Janine Benyus, Joel Makower, Andrew Winston, Ellen MacArthur and other leaders in green enterprise, the circular economy, and biomimicry. A wide range of business readers―from sustainability professionals to green entrepreneurs to CEOs―will find both wise advice and concrete examples in this new look at a master in corporate and environmental leadership, and the legacy he left.